Barrie Risman interviews Clearlight Gerald, this article originally appeared on the Yogapedia site. Prenatal yoga can be an invaluable support and maybe one of the best things you can do for yourself and your baby. Whether it’s smooth sailing or a rocky road, pregnancy is a momentous time in every woman’s life. Yoga can be an invaluable support and maybe one of the best things you can do for yourself and your baby - physically, emotionally and spiritually. What are the benefits of practicing yoga during pregnancy? • Building confidence and trust in one’s own body and honors the inherent wisdom of the body. I’ve never done yoga before. Now that I’m pregnant is it okay to start yoga? The rule of thumb is that if you do not already practice yoga regularly, you should not begin during the first trimester. There are good reasons why it’s better to wait until the second trimester to begin your prenatal practice. Firstly, if you are not aware of what feels ‘normal’ in your practice, it is more challenging to pace yourself appropriately. But even more importantly are the many changes taking place in the body (all the primary development of the fetus takes place in these early weeks.) Exhaustion and nausea are common during this time. Your work in the first trimester is to rest, eat well, and engage in very gentle activity, allowing the body to direct its full resources to the work at hand. What poses are most beneficial during pregnancy and why? •	Poses to bring overall movement to the body, maintaining flexibility and promoting overall circulation in the body. • Pelvic floor exercises to build awareness and learn to both relax the muscles and thus more effectively strengthen this area - establishing a repertoire of practices that are important to have in place postpartum to aid in healing. • High levels of the hormone relaxin that the body produces in preparation for the expansion of the pelvis in labour and delivery can result in hypermobility of joints throughout the body. Activating deeper core muscles results in greater stability and less discomfort. Therefore, exercises that build core strength while emphasizing a neutral spine are ideal, as they help to minimize common discomforts that stem from hypermobility of the pelvis such as sacroiliac pain, sciatica, pelvic and hip pain. What feels ‘easy’ early on in pregnancy can become truly challenging during later pregnancy, and what is good for one woman may not be good for another. It is essential that your primary guidance be the cues that come from within. In this way, prenatal yoga becomes an opportunity to more finely attune to the wisdom of your body and trust that it will always tell you what it needs and doesn’t need. •	Avoid extreme ranges of motion, let moderation be the theme of your practice. • Avoid a heated or vigorous yoga practice as well as any jumping or hopping movements. • Let your breathing stay comfortable and easy. 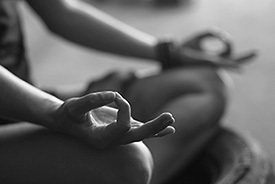 Avoid any breathing practices that involve an active breath retention or suspension, and any vigorous techniques, such as kapalabhati, bhastrika, and uddiyana bandha. • Avoid trying to increase flexibility in your poses, instead simply stretching to 60 or 70% of your capacity to maintain flexibility. This will avoid the risk of creating permanent instability in your joints. • Be particularly careful or even avoid gravity-assisted stretches (such as pigeon or a deep hip opening lunge) in which it is easy to inadvertently stretch the ligaments of the pelvis. After the first trimester do not practice poses that require lying on your belly. During the second and third trimesters, avoid sustained back-lying postures if you experience discomfort. If preliminary signs of discomfort are ignored, nausea or dizziness may follow indicating that circulation for Mom and growing baby has been temporarily restricted (if this happens, come out of the position). Many instructors will thus avoid teaching poses where you are lying on your back. However, if practiced mindfully with full permission to come out if, or as soon as, the position becomes uncomfortable, valuable benefits of supine poses can still be derived, especially earlier in your pregnancy. Create and maintain space for the both of you by always lengthening the spine. Forward bends should be practiced with a neutral spine, respecting the natural curves of the spine. Any backbending should be moderate and should emphasize the movement of the thoracic spine, with attention to lengthen the lower back and minimize lordosis. Avoid deep twisting, including any ‘closed’ or ‘bound’ twists (poses where the body twists over a bent leg.) Gentle, ‘open’ twists (where the front of the body is open) are fine as long as they feel good, with the focus being on poses that mobilize the thoracic and cervical spine. Avoid rolling up or down from lying to sitting (potentially aggravating any diastasis of the rectus abdominis). Instead, roll to one side and use your arms to come into an upright position. • By the third trimester inversions may not promote optimal fetal positioning. • For these reasons I tend to avoid teaching inversions, with the exception of the occasional downward dog during the second trimester. What happens in a typical prenatal class? Prenatal classes will vary in their format, however many classes will begin with a check-in to support the community of the group. This is an opportunity to share questions, concerns and resources. Then, the class will proceed similarly to a regular yoga class, beginning with a centering and breathing exercises, warming movements and a series of poses with breathing awareness interwoven, concluding in a guided relaxation and meditation. Should I talk with my physician before taking prenatal yoga? Women should always check in with their doctor or midwife before beginning yoga, or any exercise program. Pregnancy is normally straightforward and the benefits of prenatally appropriate exercise are undeniable to those women who have a normal, healthy pregnancy. Your doctor or midwife will likely tell you not to practice yoga if they have any concerns about your health or determine a risk of preterm delivery, and may even prescribe modified or full bed rest. A meditation or yoga nidra practice is a wonderful alternative in such cases. If I already have a yoga practice when I get pregnant can I continue to attend regular classes? If you have an established yoga practice (i.e. you’ve been practicing weekly for at least a year), it is normally fine to continue with your regular practice as long as it feels good in your body. It’s important that you’re comfortable with modifying as needed and that you are fine with a more gentle approach than you may be accustomed. If you are attending a class, be sure your instructor is aware and confident in guiding you accordingly. She or he will advise you of any modifications you may need to make. If you find yourself in a habitual mode of pushing your limits in your practice, or if you are experiencing nausea or fatigue, it may be better to take a break and resume a specialized prenatal yoga in your second trimester. What can I take from prenatal classes into “normal” yoga classes? For many women, prenatal yoga is their introduction to yoga and just the beginning what ends up being an exquisite journey ahead. And, for the many women who have already been practicing yoga and/or meditation, the introspective nature of listening and slowing down necessitated by pregnancy opens new doors of inquiry and awareness that deepen their practice upon their return to ‘normal’ classes. Barrie Risman is the Co-Director of The World Spine Care Yoga Project and the proud creator of The Skillful Yogi, a thriving, online community of yoga teachers and continuing students from around the world. 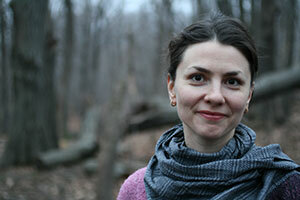 She is the author of the forthcoming book, "Evolving Your Yoga: Ten Principles for Enlightened Practice. Clearlight Gerald (MA, C-IAYT, E-RYT, RPYT) is an internationally accredited professional yoga therapist, and yoga and meditation teacher, with over two decades of experience teaching and supporting hopeful, expectant and new mothers. Working primarily in the Montreal area, she has guided thousands of women and new parents in her private sessions and group classes. She is also a senior iRest meditation teacher and an active mentor with the iRest Institute in California. As a trained specialist in iRest Meditation and mindfulness practices, she brings her specialized knowledge into the perinatal context of fertility, pregnancy and childbirth. Her individualized sessions focus on meditation and yoga, and allow for the development of personalized strategies and practices to help reduce stress, minimize suffering and improve overall wellbeing, while also providing an opportunity for meditative inquiry and perspective, clarity and insight. Clearlight often meets individually with women who, while under the care of a psychologist or psychiatrist, also seek to complement their therapeutic work by building a repertoire of mindfulness-based tools and strategies. The foundation of Clearlight’s approach is the iRest Yoga Nidra program, a body-centered form of meditative inquiry developed by her longtime teacher and mentor, Dr. Richard Miller.